Wherever you decide to stay, a drive along the northern California coast is visually breathtaking, and if you find a comfortable inn to lay your head, so much the better. The Benbow Historic Inn is just such a place. It is also as interesting an auberge as you will find anywhere along the great and scenic Redwood Highway. We reached exit 636 on highway 101 at 3pm and at the onset of a downpour. The Inn appeared within seconds of leaving the freeway. It was a welcome sight, sitting on a hillside surrounded by a crown of the deepest green trees. If we didn’t know we were in California, we could be convinced we were in England. 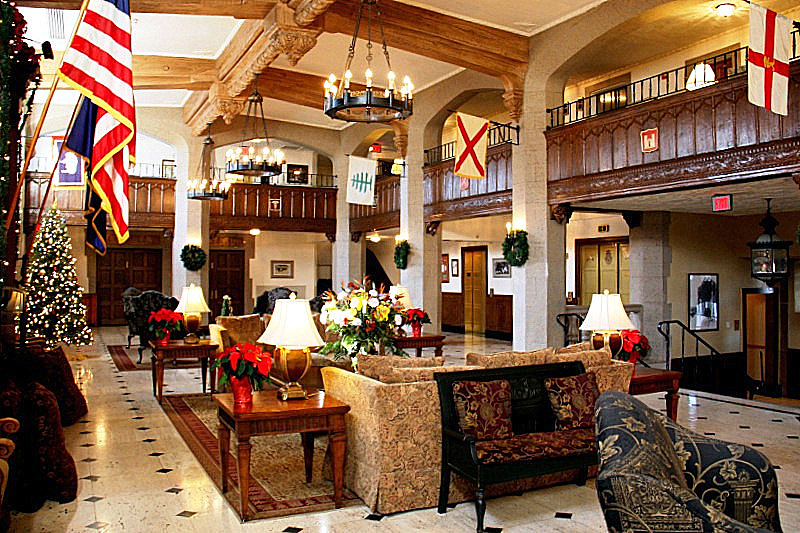 First open to the public in July 1926, this historic Tudor style hotel elicits old world charm inside and out. In a place where private bi-planes parked to disembark the elite of Hollywood’s past there’s now an extensive parking area for guests and visitors to the Inn. The list of Golden Age screen icons that frequented the Inn includes Spencer Tracy, Clark Gable, Alan Ladd, Charles Laughton, Nelson Eddy and Jeanette MacDonald, Joan Fontaine (honeymooned twice), and Basil Rathbone. Dignitaries included Eleanor Roosevelt, Herbert Hoover and more recently the King of Jordan, as well as entertainers Danny Glover, Matt Leblanc, and Cher. The lobby is new and part of an extensive renovation and improvement project completed in 2018, but it has a sense of place that fits well into the original structure. Note for those who have not visited the Benbow of late: Further to adding space and upgrades, the new addition has made the Inn ADA compliant. Also, an elevator has been installed – blissfully ending 9 decades of hand carrying luggage up several flights of stairs. Walking to our sleeping room we felt a sensation of leaving the present and being drawn into a nostalgic journey back to a more reserved 1930s and 40s. After a long drive in the rain, it was a welcome adjustment. We had been assigned the Burtis Benbow Suite. A beautiful room well decorated with period antique furnishings, tasteful décor, and a fireplace. We loved the room, but there were two problems. The thermostat was set at 70 degrees, but the room was 82 degrees. Wayne clicked on the bathroom lights, but nothing happened. He tried several times to no avail. Judy tried once, and voila, there was light. We called the front desk, and the clerk immediately assigned us another room. Wayne clicked off the bathroom light, but it remained on. Judy clicked, and the light went out. Surely, there was a reasonable explanation. Consider that Burtis Benbow was the 4th Benbow child and considered a mechanical genius. Perhaps his genius extended to apparitional mechanical pranks? 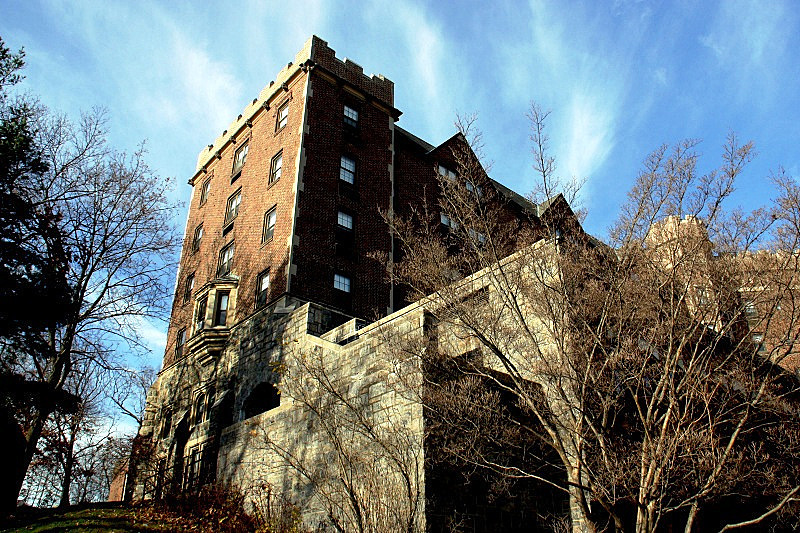 During our stay at the Benbow, we learned of numerous ghostly incidents experienced by other guests and employees. Small anomalies like unexplained changes in room temperatures, pillows relocated, sherry decanter tops missing, furniture moved, office paperwork shuffled, and phone calls from empty rooms. No reports of any guest possessions being moved, only manor property. By all reports, people experiencing these oddities seemed genuinely thrilled at the thought of being part of a friendly ghost encounter. We concluded that for the first time in our many years of staying at supposedly haunted lodgings, perhaps we had finally experienced our first paranormal event. It’s easy to see why the old Hollywood crowd, and the motoring public traveling on the new Redwood Highway in 1926, enjoyed the Inn – the relaxation. Originally, 1290 acres of pristine wilderness provided opportunities to horseback ride, hike, bicycle, swim, boat, fish, lounge in a garden setting, and commune with nature. Almost 100 years later, much of the attraction remains. There’s now a 9-hole golf course; the lake is gone, but the Eel River still flows gently along the Inn and under the old stone bridge. The scene is still peaceful and serene. The outdoor patio is inviting. Our visit took place in winter, but it’s easy to imagine relaxing on the Parisian style patio with book in hand, enjoying the sound of birds and the delicate scent of flowers. We are anxious to return when everything is in bloom. A short 20 mile scenic drive north from the Inn puts you at the gateway of the 31 mile long Avenue of the Giants 101 bypass near Humboldt Redwood State Park. We took the Avenue road, but it was raining hard, and not enjoyable. We look forward to the drive in better weather. 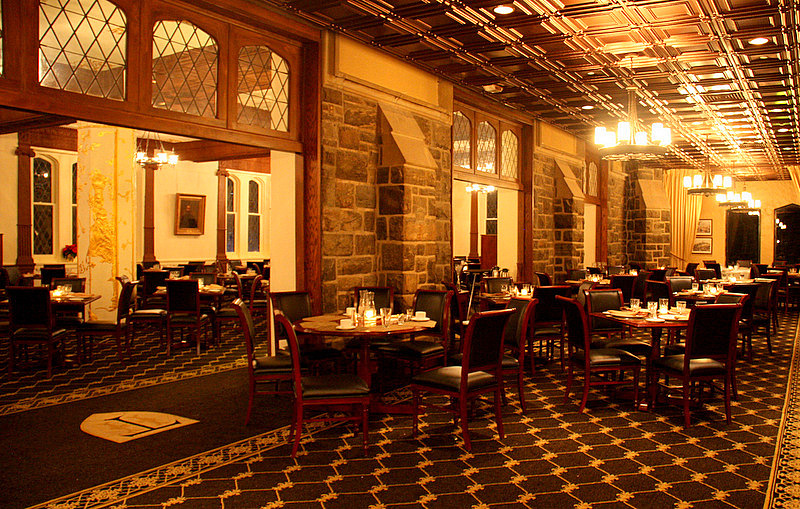 The main gathering room of the Inn is called the upper lobby. It is a large space and can easily accommodate a sizable crowd. A cozy fireplace warms the room, which is conducive to a friendly conversation, reading, game of chess, cards, or just relaxing. The library is yet another comfortable space for guest enjoyment. The bar was part of the renovation, and completed with painstaking care to give it an appropriate stance in the overall atmosphere of the Inn. The bar menu is inviting and Wayne’s special request for a grilled cheese sandwich and Caesar salad rendered an appetizing meal, artfully presented. Judy delighted in a kale and farro salad embellished with, butternut squash, candied figs, caramelized onion, cotija cheese, toasted pepitas, and topped with a maple vinaigrette. The Inn’s deep and diverse wine list of over 450 selections has earned the Inn several years of Wine Spectator Excellence Awards. “Delicious foods are enhanced by scene and spirits.” Surrounded by elegant wooden muntin framed windows, the dining room at the Benbow Historic Inn has a decidedly British panache that demonstrates the designer’s refined taste in old-world décor. The experience is like dining in a fashionable English country house. Our morning meal consisted of eggs, delicious sausage, and the absolutely best crushed potatoes imaginable. The chef revealed, “The secret is to boil the full skin potatoes, fry them crisp, lightly pepper and gently crush.” Delightful! If you enjoy being in a place with history, step across the threshold of time to a golden age where luxury was expected, and attention to fine dining and personal details was always the order of the day. The erstwhile glamour and sophistication are still there in the northern California forest – at the Benbow Inn. In 1983, the Inn was placed on the National Register of Historic Places – kudos to the selection committee. In 2018, Historic Hotels of America bestowed the Best Small Historic Inns Award (under 75 guestrooms) on the Benbow Inn. 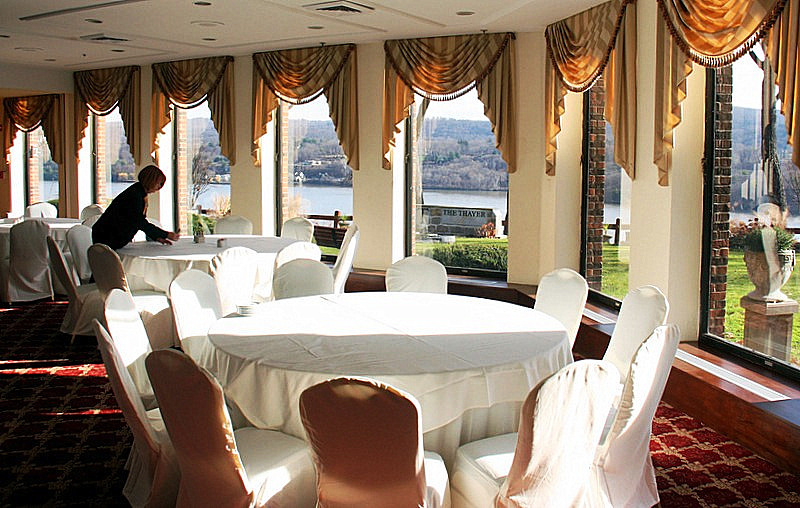 The Inn is an excellent venue for a corporate retreat or wedding for up to 225 guests. Electric car aficionados: In these parts, it’s a long way between charges, and Benbow Inn has charging stations! In our fast-paced world, any opportunity to get away from it all, even for a short while, can do wonders to re-energize our lives. The Benbow Historic Inn offers its own special magic from another time and place. So, choose from a range of guestroom types to suit your taste, soak in the refined ambiance, and enjoy a getaway at the Inn. 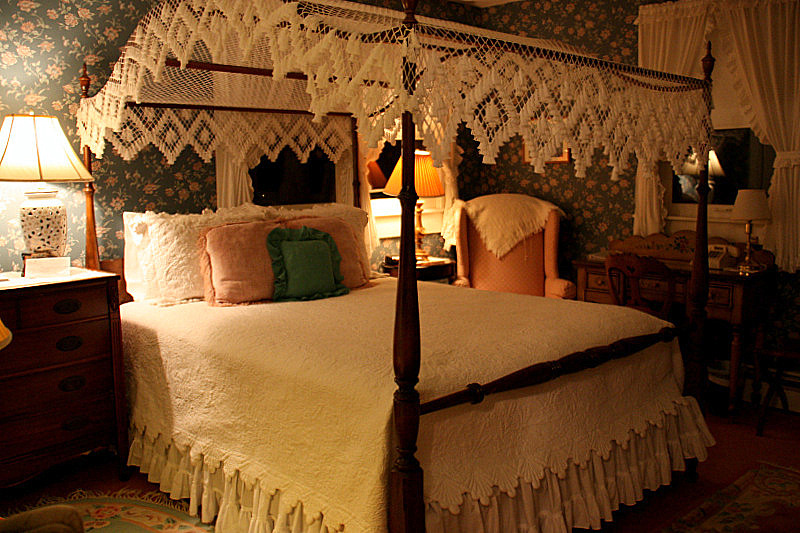 The Benbow Historic Inn has an excellent website that provides everything you need to know. Whenever we travel, we are protected by AllianzTravel insurance. The opinions expressed in our articles are the journalists’ alone, and have not been reviewed, endorsed or approved by any entity. Lodging preferences are so personal. With the advent of the internet, travel magazine advertisements have given way to lodging websites and individual reviews on TripAdvisor and Yelp. Of course, lodging websites are no more objective than print ads – which leaves us to depend on personal reviews to help us decide on the best places to stay. Unfortunately, personal reviews run the gamut of “wonderful,” to “horrible” for the same property. So what’s a traveler to do? One suggestion is to single out reviews written by dependable travel writers. As travel journalists specializing in luxury travel, our mission is always to find, photograph, and write about a unique lodging where discriminating travelers would enjoy a stay. In addition to cleanliness, we look for something unusual, historic, or really special. If we happen to pick a place that turns out not to meet those standards, we don’t write about it. We may have wasted our time, but we won’t waste yours. We were heading down the picturesque Oregon and California coasts along highways 1 and 101 to the port of San Francisco. We were scheduled to write about a Princess Cruise to the popular Mexican Riviera. We thought the drive would be an excellent opportunity to point out some genuinely special places to stay along the route. The northern Pacific coastal drive is a breathtaking adventure, and we wanted to find lodgings that would complement the excitement of the trip. We found three properties to write about. The first is Scopa at the Sea. Scopa at the Sea’s location in Crescent City, California fit perfectly into our self-imposed daily drive limits. It turned out to be a stellar choice! We rate it as one of the top boutique B&Bs of the hundreds we have reviewed. The weather was not cooperating and it had been blustery and raining all day. In spite of the bad driving weather, we felt fortunate to see some super-exciting ocean scenes along the way. The Scopa is in a residential neighborhood, and on an oceanside street with amazing panoramic views. We arrived at the 3 p.m. check-in hour. The house has been recently remodeled and redesigned for the purpose of becoming a B&B for discerning guests seeking a special haven apart from the ordinary. The public rooms include a cozy living room with a creative mantel made from parts of a vintage organ that had been played in that same room years ago. Following on, there is a spacious gathering room, dining room, and kitchen. A perfect layout for socializing or finding a private corner to enjoy the exclusive company of your roommate. Deborah, the gracious innkeeper is a delight and an excellent baker and cook. Waiting for us was a home-baked banana cake with banana walnut frosting – all made from scratch. Yummy! Other guests arrived at approximately the same time, and dove into the cake before we could tempt you with a fresh close-up photo. Around seven, Deborah laid out a selection of local cheeses and we did a little wine and cheesing along with a bit of friendly conversation before retiring. It’s difficult to explain why this house has the aura of a lighthouse keeper’s cottage. Certainly, the tasteful nautical décor and paintings are part of the reason, as is the restless and magnificent ocean view from so many windows, but there’s something more. If you stay at the Scopa, we invite your input. Our second level sleeping room is named the Whale Horizon Spa Suite. It is a nicely appointed, spacious room with an inviting bath. Its stunning views entice you to gaze at the marvelous ocean and rugged outcroppings that make up the rocky northern California coastline. The beach below our window, and just across the street is known for agates and is appropriately named Pebble Beach. Our fellow guests were a congenial and interesting couple from Miami, Florida. We had planned a quick getaway after breakfast, but ended up staying right up to the 11 o’clock check-out time. Our new friends were pleased to have stayed in the suite next to our own. It’s named the Seal Song Suite, aka the Hugh Jackman Suite. It’s probably unusual to have a celebrity stay in the little town of Crescent City, so we applaud the Scopa folks for unofficially promoting it. A photo of Hugh Jackman in the living room is available in the guest photo gallery on the Scopa website. We woke from a sound sleep in a luxurious king-sized bed to the wafting aroma of freshly ground brewed coffee and sizzling bacon. We thought this was a great way to entice all guests to the communal morning table. Breakfast consisted of apple waffles with homemade apple syrup, pecan topping, eggs, bacon, and baked sausage. After the morning feast, we bid farewell to Deborah, who by now felt more like family than an innkeeper. For more details about the finer points and reservations look at the website www.Scopaproperties.com. Scopa at the Sea prices are very competitive considering what you get in indelible vistas, luxurious furnishings, conveniences, an exquisite breakfast – and other foodie treats. There are only three guestrooms on property, so it’s best to reserve early to avoid disappointment. By the way, don’t be confused by the Scopa properties website. There are actually two buildings on one property, and one more at a different location. Scopa at the Sea is the three guestroom bed and breakfast inn where we stayed (above right), while the building to the left is called the Seaview Beach House and has three spotless and lovely housing units, Agate – Fern – and Pebble. Two units have mini-kitchens, and one has a full-size kitchen. These are fitting homes for any duration. On the short drive back to Hwy 101 to continue our trek south, we passed the picturesque Battery Point Lighthouse in Crescent City. It was a windy day with sweeping punctuated rain. Fortunately, the stormy weather added to the kaleidoscopic colors that showcased this remarkable landmark. Next stop, the Inn at Newport Ranch in Fort Bragg, but that’s a story for another time. Whenever we travel, we are protected by Allianz Travel insurance. There are certain jobs that people dream about. A frequent fancy in a troubled world is being a lighthouse innkeeper where one can enjoy the peace and serenity of the ocean and abundant sea life. ©Travel Photo Interact – Place your cursor over any photo to enhance it. We wanted to see if the lifestyle of a lighthouse innkeeper might be in our future. We arranged for a visit to East Brother Island and its popular light-station located just a 30 minute drive from San Francisco. Join us, this just might be your cup of tea. East Brother Island is in San Pablo Bay, which connects to San Francisco Bay. East Brother Light Station is managed by a Richmond nonprofit preservationist group, which in 1980 obtained permission from the Coast Guard to renovate and maintain the active light station. The organization has many volunteers to help with the constant maintenance, and pays most of the bills by renting out the island’s five bedrooms, four days per week. After a series of email communications, we arranged to meet and interview the lighthouse innkeeper couple on East Brother Island. On Monday morning, we were waiting at the less than luxurious Point San Pablo Yacht Harbor when our Captain/innkeeper pulled up to the dock in the island’s aluminum tender. There is plenty of free parking at the Yacht Harbor. Before we could board the boat, the Captain first assisted the guests that were leaving the island. The visitors must have enjoyed their island experience because they were all laughing and carrying on as if they were old friends. After introductions, our host started the engines and headed out of the harbor for a short 10-minute ride to the island. He immediately gave us a briefing about what to expect when we arrived dockside. He described how we would be required to climb a very vertical stainless steel pool type ladder that extends from the boat deck to the landing pier that is joined to the island. Depending on the tide, the climb can be as much as 12 feet. Think about that before you make reservations if you are not physically able to climb a ladder. Also, the island is unfortunately not able to be ADA compliant. The one-acre island has two vintage buildings in addition to an 1874 Victorian Lighthouse. The old work shed has been converted into a cozy innkeepers’ cottage, and the other out-building houses the machinery necessary to power the working foghorns. The island has electric power supplied by an underwater cable from the mainland, and a self-contained water system that holds about 90,000 gallons of rainwater stored in a white-clad underground cistern and an above-ground redwood water tank. Because of the ever-present danger of water shortages in the Bay Area, there are no showers available for guests staying only one night. No one seemed to mind the inconvenience. We soon found that our hosts had only been lighthouse keepers for ten weeks, and as of this writing they have already moved on to their next adventure. Lighthouse keeping is fun, but demanding work, and the turnover is quite high, but that’s apparently not a big problem for the stakeholders. How many folks would love to run a Victorian Bed and Breakfast on a small island in California complete with a good salary, room and board, seals, pelicans, and a five-star view of the San Francisco skyline? Lots, that’s how many. We are told that the number of applicants for the job is usually large, but there are serious knockout factors in the innkeeper application. One of the applicants must be an excellent cook and capable of preparing and presenting food for a table of ten. Another qualification is that one of the applicants must have a Coast Guard commercial boat operator’s license. Lastly, both of the prospective innkeepers must be charming. Now we are getting somewhere. In the case of East Brother Light Station, the island is open for business four nights per week starting on Thursday. On Wednesday morning, the innkeepers are on land shopping for provisions for up to 40 guests (5 rooms x 2 guests x 4 nights). They select the food for the menu, pick up the mail, laundry, fuel, and anything else they will need for the coming week on the island. On Thursday morning, they boat back to the island with the supplies, unload their cargo into a large wire cart waiting on the pier, and winch the cart up a steep ramp that connects the pier with the island. They unload and store the supplies, and get the island ready for visitors. On Thursday afternoon promptly at 4pm, the designated Captain/innkeeper returns to the marina dock at Point San Pablo Yacht Harbor to board the guests for Thursday night. Upon arrival back at the island, the hosts provide a tour, hors d’oeuvres with champagne, and show the guests to their rooms. The visitors then have ample time to explore the small island and enjoy the sea birds, animals, and fabulous views before dinner. At dinner, the visitors are served an exquisitely prepared multi-course meal of the finest fresh ingredients. All the guests are seated at one large table, which makes for a convivial atmosphere and an opportunity to socialize. 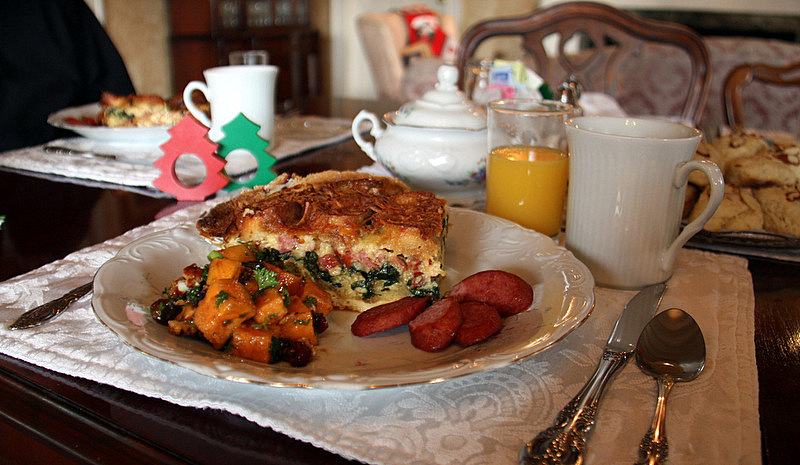 Friday morning would come all too soon, but a sumptuous gourmet breakfast would await all guests. Pity those one-night guests who must now head back to the mainland to resume their everyday lives. After transferring the guests and their baggage to the mainland dock, the captain returns to the island to help his partner clean and prepare for new guests on Friday afternoon. Saturday and Sunday are a repeat of Thursday and Friday. After bidding farewell to the last guests for the week on Monday morning, the innkeeper heads back to the island and the chores that couldn’t be completed during the workweek. Later in the day, the innkeepers load the laundry along with the empty bottles and trash into the island wire cart. The cart is pulled to the opposite end of the island and hooked and lowered by winch down to the island’s waiting boat. The innkeepers depart for the harbor, unload the cargo, and start a well-deserved Tuesday day of rest. East Brother Light Station innkeepers live a romantic life full of guest kudos, fresh air, sunshine, seabirds, and seals. There are probably several of our readers that would trade places if they could. Life is short, you might want to give it a try! However, we decided not. If you would like to be a guest at East Brother Light Station click here. Safety is important so there are several unique restrictions, be sure to check them out before making reservations. Photos Copyright © Judy Bayliff – unauthorized use strictly prohibited. Move your cursor over the images to enhance them! In 1945, Hollywood coined the phrase “Christmas in Connecticut” after the movie of the same name. 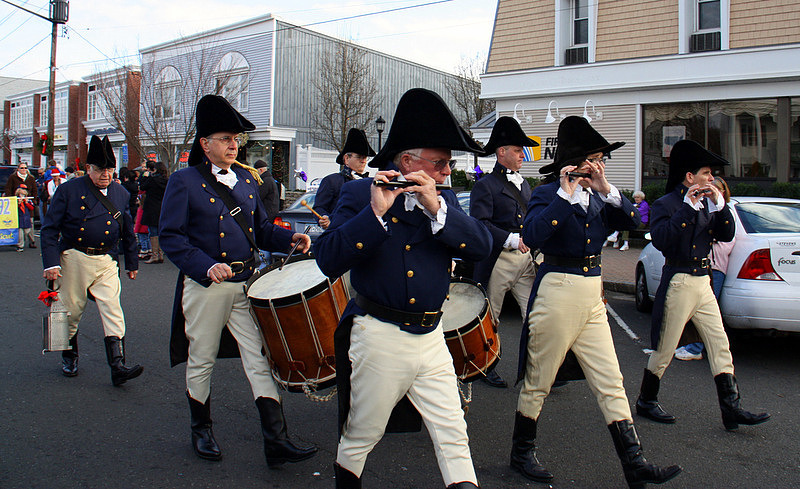 Since that time, romanticists around the world have dreamed of spending at least one winter holiday in a quaint Connecticut hamlet complete with a town common crowned with freshly fallen snow and carolers strolling by storefronts and elder homes. The scene that is presently in your mind’s eye is not a figment from a Currier and Ives print – it actually exists – and we found it. We landed at JFK airport on a cold day in early December. 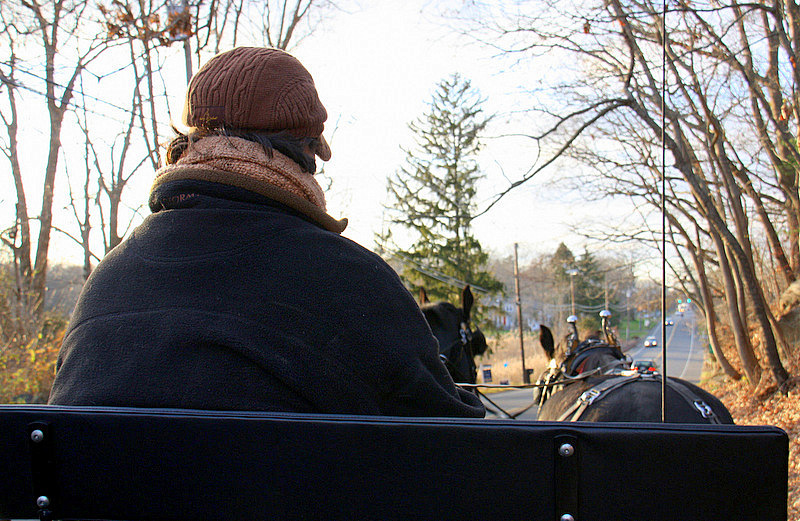 We rented a car and headed for nearby Connecticut at a time when many small towns and villages throughout the area are preparing for the upcoming holiday season. Janet Serra, the Executive Director of the Western Connecticut Convention and Visitors Bureau, and Anne Lee, the Executive Director of the Central Connecticut Regional Tourism District provided us with valuable holiday tips for our project. They also gave us several places to consider. After reviewing what each location had to offer by way of Christmas spirit and activities, we settled on the little town of Madison. First settled in 1650, Madison was renamed for President James Madison and incorporated in 1826. 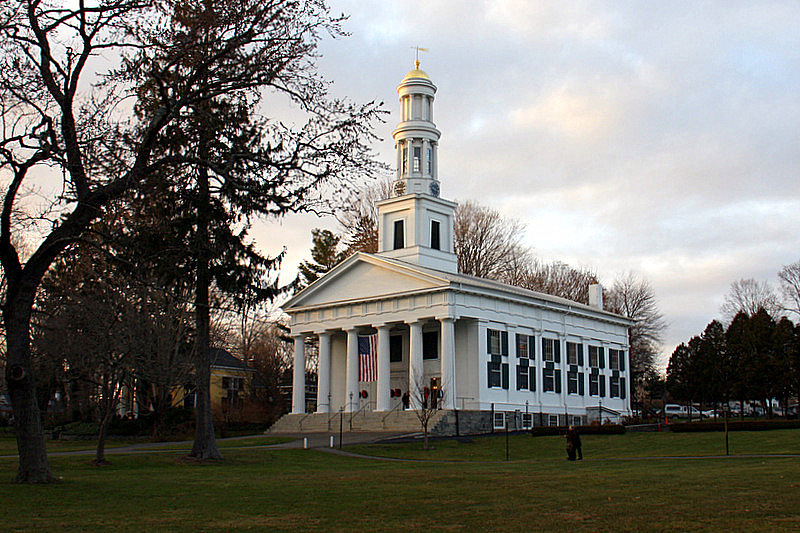 Madison is a pleasant little community along historic Route 1, the Boston Post Road in the “Connecticut Shoreline Area.” The town lies approximately equidistant between New York City and Boston. Yale University is just 20 minutes away. 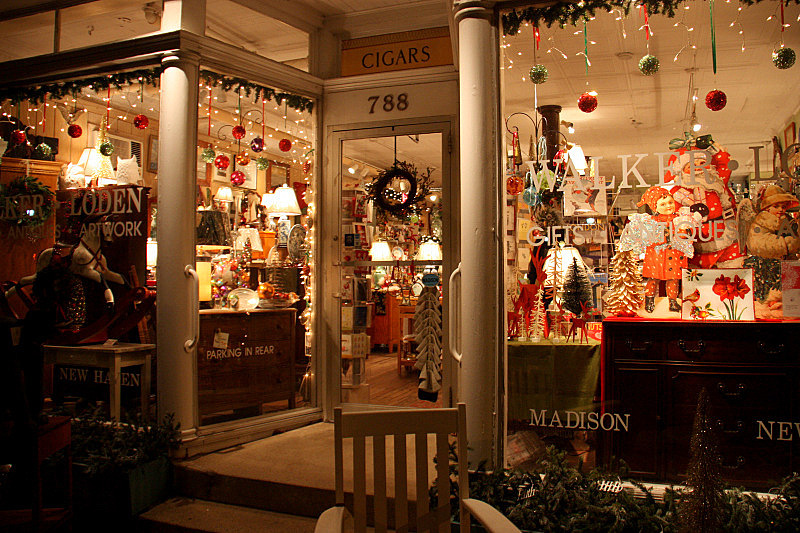 By the time we arrived in Madison, the small shops that make up the bulk of retailers in the village center were ready for the holidays. 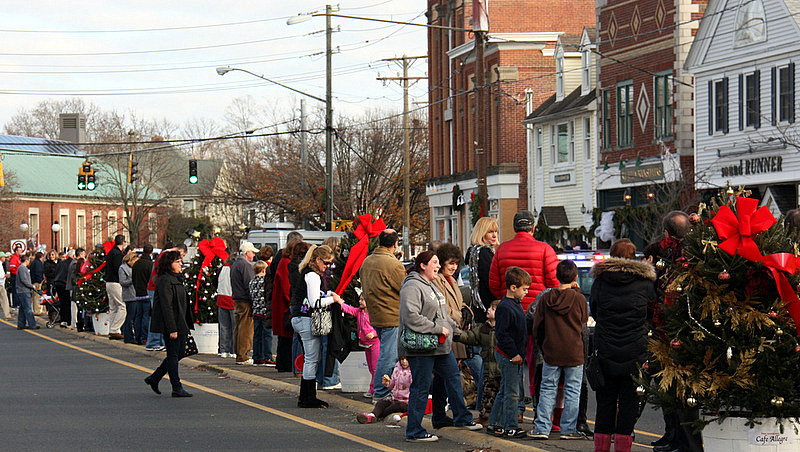 Most were sporting holiday decorations and touting special sales – many to benefit local charities and civic projects. Before we walked the entire town, we decided to check into our chosen lodging for our time in Madison. We had searched for a place that was like a relative’s warm and inviting home – an inn that properly fit into our pastoral Christmas picture. The Tidewater Inn (circa 1928) is a bed and breakfast that proved to be exactly what we wanted, and it was an easy walk to downtown Madison. Congenial Victoria Kolyvas, is the owner of the Tidewater Inn, and she was the perfect personality to help us with an itinerary that would give us a flavor for all the seasonal activities and events that would be taking place in and around Madison during our brief stay. She pretty much planned our visit for us, and we could not be more grateful. We will also mention right here and now that Viki is a superb host and cook! 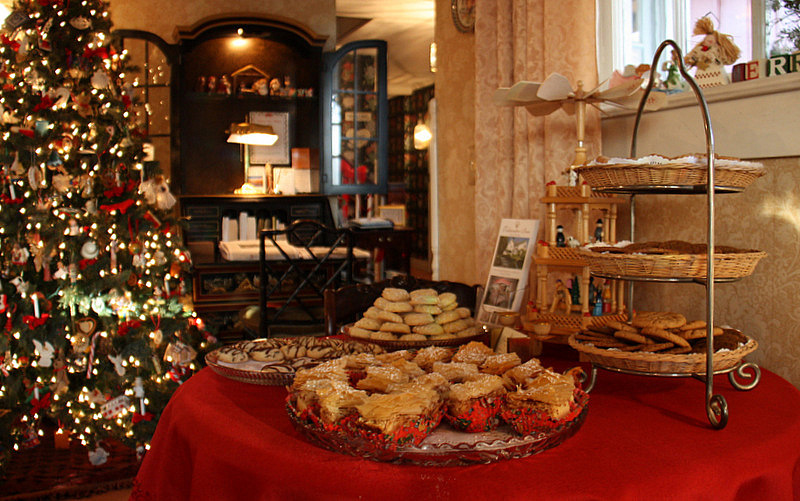 Innkeeper Kolyvas already had the Tidewater spruced up for the holidays. A beautifully decorated tree sat next to a cheery fire in the hearth in the dining/tea-room. We ate some bountiful breakfasts and had friendly afternoon chats accompanied by local wines and cheese at a large table in that same room. 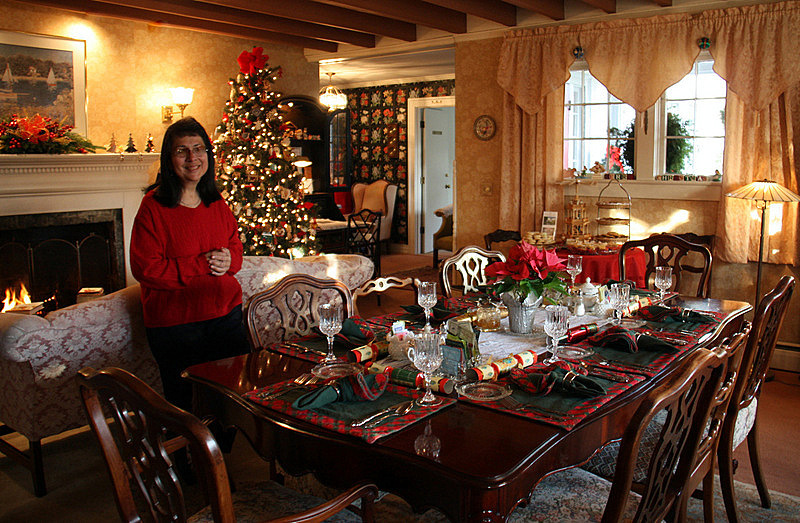 Staying at the Tidewater Inn is very much like going to grandma’s house for Christmas. It provides a feeling of sanctuary – of returning – coming home. 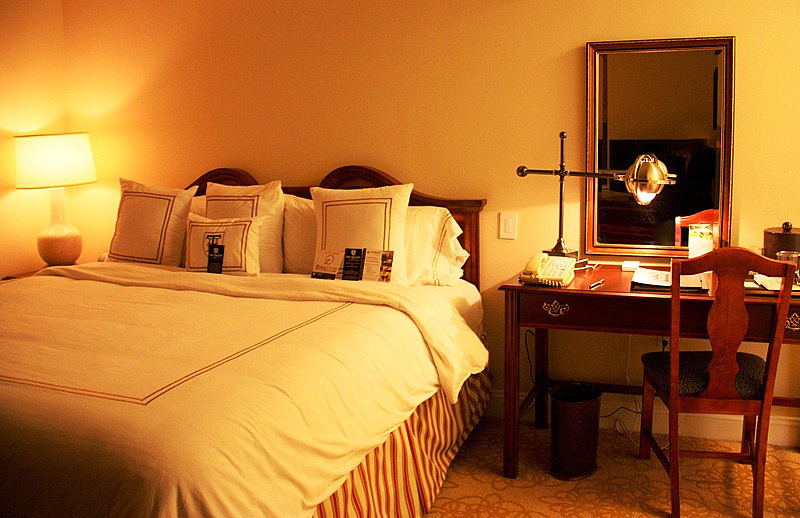 Each of the nine guestrooms is pleasantly decorated with beautiful antique furnishings and other tasteful décor. Our room was cozy and warm, and we slumbered each night in luxurious comfort. After a sumptuous gourmet breakfast at the Tidewater, we took our air with a brisk walk to the center of Madison. We visited a number of shops and craft fairs and found one event particularly delightful – the “Décor Encore” at St. Margaret’s Church. It was advertised as the place to find “previously loved Christmas decorations revived and ready for a new home.” The fair also featured beautiful homemade quilts for sale. What a treat! 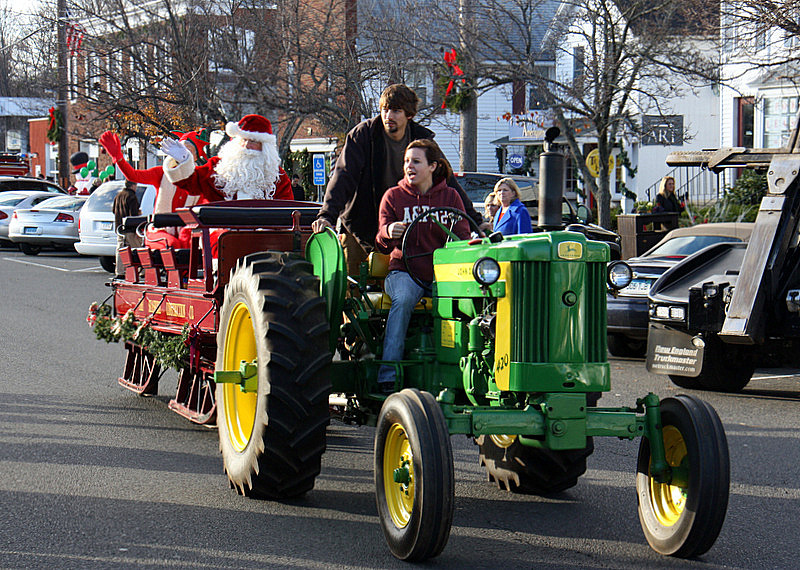 In early December, the Madison Chamber of Commerce has a homespun Holiday Parade that brings out the entire citizenry. Some colorful participants and unusual costumes and floats gave us big smiles. It was a wonderfully crisp winter day, perfect for this wholesome family entertainment. 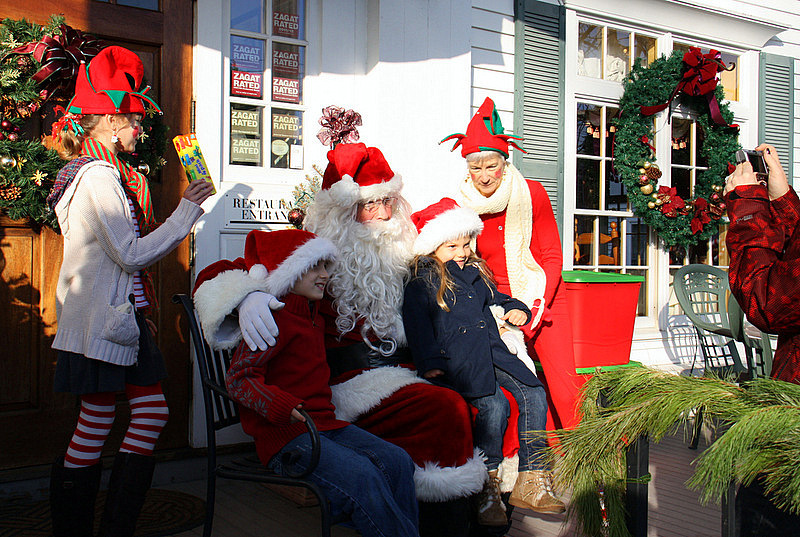 Santa, his wife, and a comely elf stopped by a local café to chat with the kiddies. Donations for the needy of non-perishable food items were accepted to help the Madison Food Pantry. We also dropped by the local bookstore to watch Santa Letter Writing – great fun. 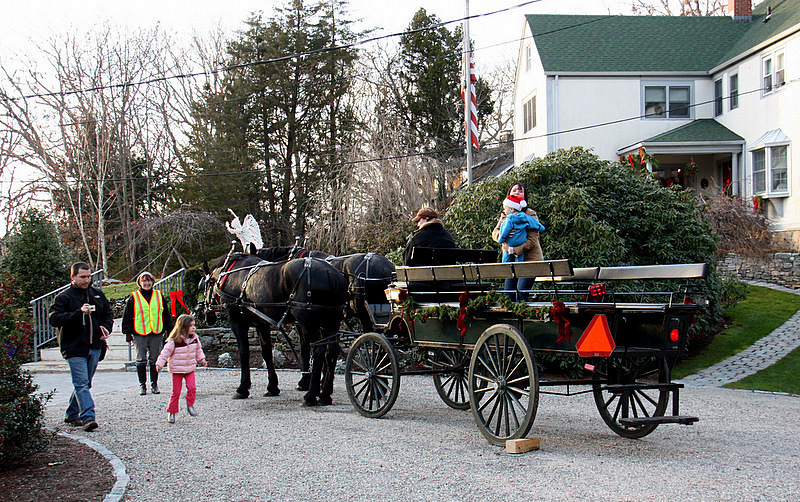 During parade day, the Tidewater Inn, along with one other local inn, provides a Christmas Open House and Tour of Madison’s Historic Inns via a horse drawn wagon that clops from place to place, and stops for passengers to imbibe on Christmas cheer and sweets – all for the benefit of local charity. Later that afternoon, we enjoyed the “Soul Concert” at the local First Congregational Church. 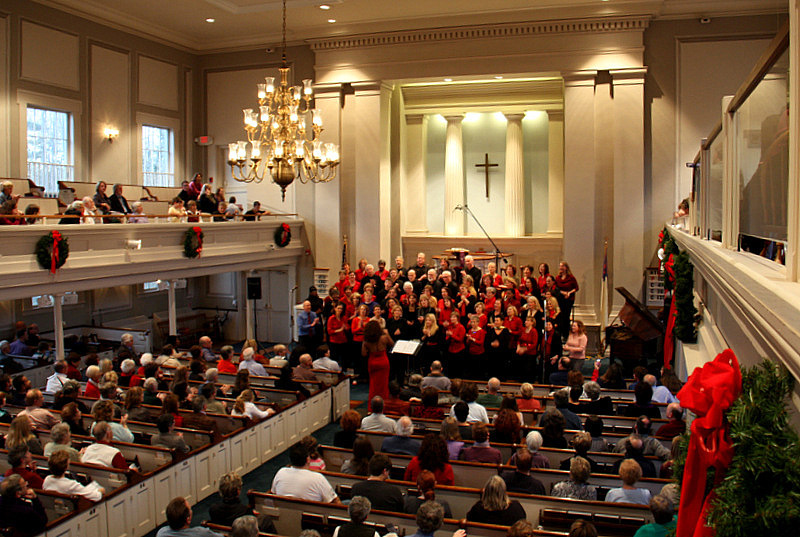 It featured holiday songs sung by an accomplished volunteer choir in a beautiful church. The entire scene was truly inspirational. The singers were led by a highly talented conductor who had the choir and audience hand clapping and singing along. This is an annual event you do not want to miss. Any freewill offerings from the event went to support the Village Mountain Mission. 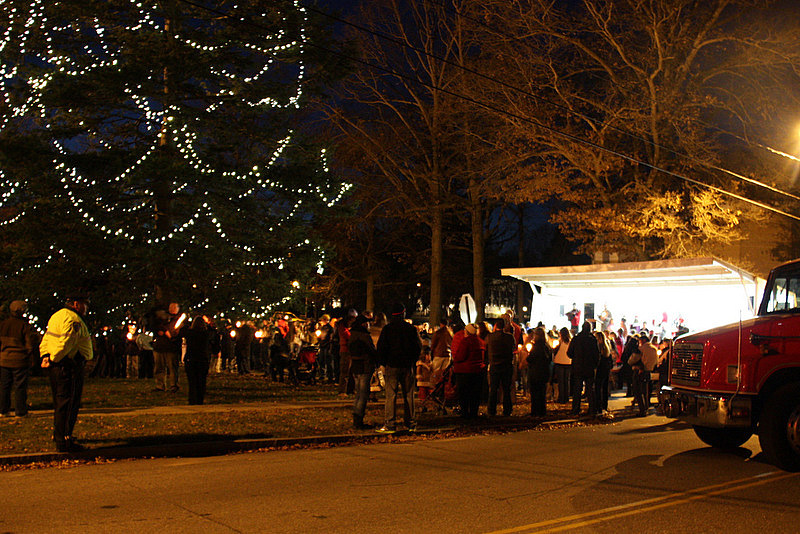 As dark descended on the expansive town green, it was time for the annual Christmas tree lighting. Three, two, one – Merry Christmas! Happy Hanukkah! Families and friends gathered around the lighted tree to drink complimentary hot cocoa and watch the children wonder at the magnificent tree and colors. 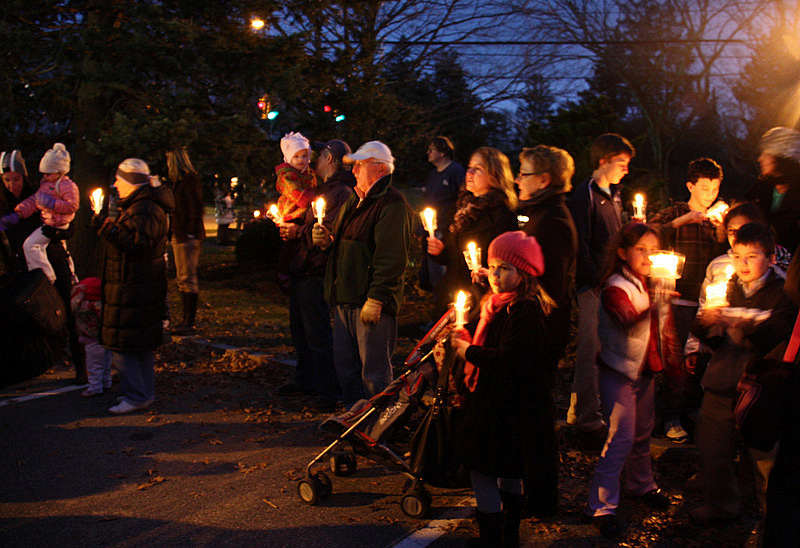 Everyone was holding candles and having fun talking with their neighbors. It was a scene right out of Norman Rockwell, and we could not help thinking that once upon a time, much of America celebrated Christmas in just such a grand manner. Victoria told us that we would run out of time before we ran out of things to do in and around Madison – at any time of year. We found that during the holiday season she was most certainly correct. Fortunately, she planned enough time in our itinerary for a wonderful event. We had never heard of Ahavah, which is the Hebrew word for love, and we soon learned that it was also an original ballet about a young girl’s search for the true meaning of Christmas. It is performed annually in early December by the Christian Academy of Dance at the Morgan High School in nearby Clinton. Do not be put off by the venue. This is excellent entertainment professionally written, choreographed, and directed. “Let them praise his name in the dance: Let them sing praises unto Him with the timbrel and harp. For the Lord taketh pleasure in His people.” The young performers in this ballet seemed to take the ancient words to heart. 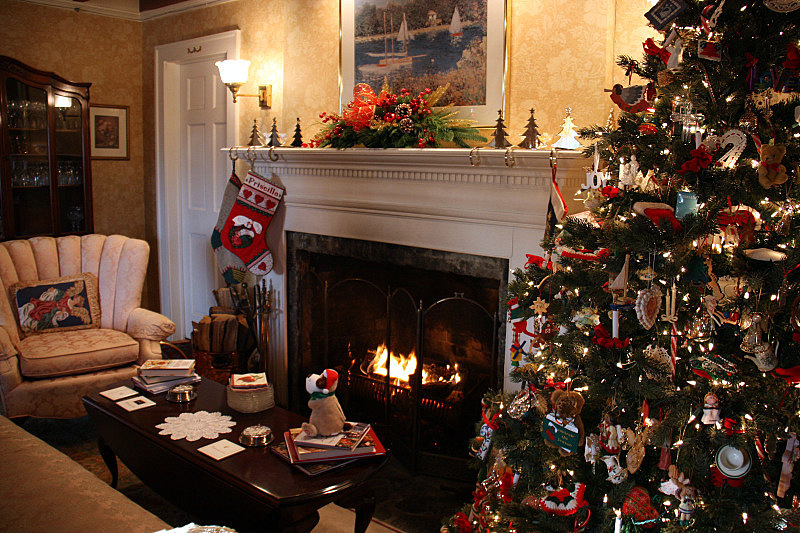 We hope we can return to Madison and the Tidewater Inn for another holiday season one day very soon. It was everything we had hoped. 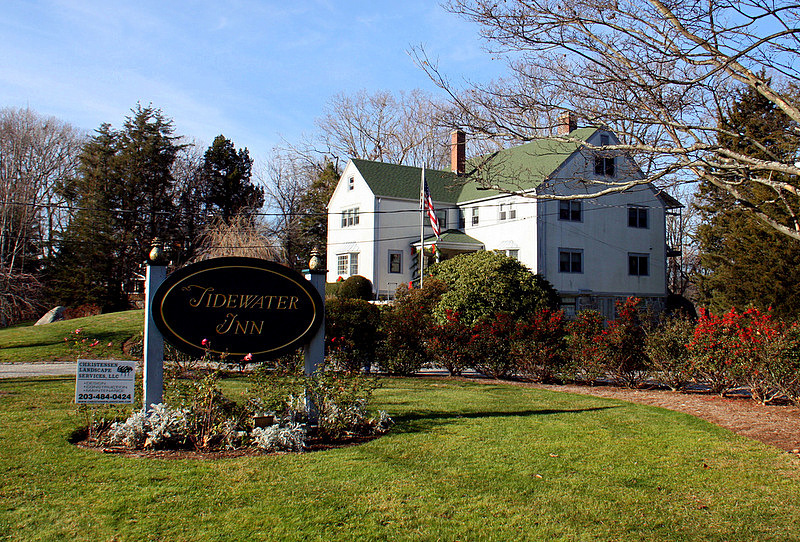 Look *here* for more information about the Tidewater Inn. 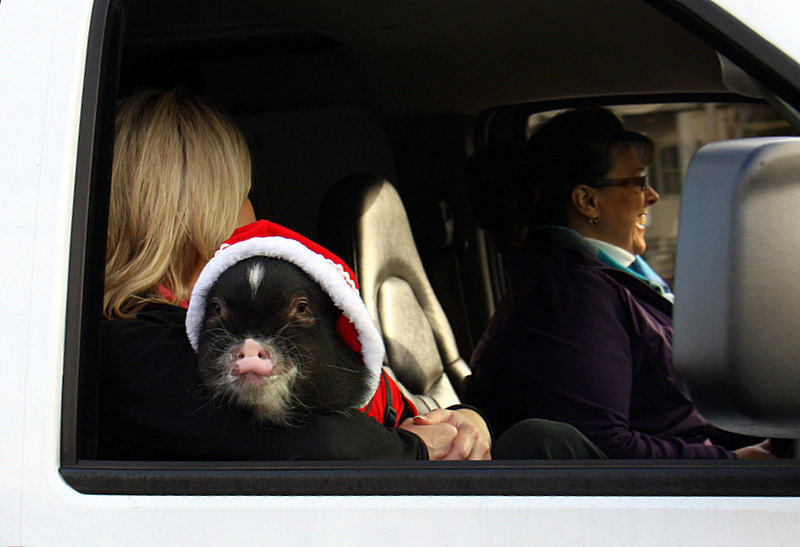 Happy Travels – Happy Holidays – Remember our troops! Much of the Oregon coast consists of miles and miles of beautiful sandy beaches, which may be exactly what you are looking for if you seek total relaxation. However, if you crave excitement, check out the wild 40 miles of rocky shoreline that begins in the north at Waldport, Oregon and zigzags south along curvy Highway 101. Here, for your winter touring pleasure, nature provides scenic headlands and lofty volcanic outcroppings that plunge precipitously to the unbounded Pacific several hundred feet below. The best of the stretch is known as Cape Perpetua. The views are so exceptional that the rugged expanse has been federally designated a National Scenic Area. Captain James Cook discovered and named Cape Perpetua in 1778. The mountainous wooded territory remained virtually unreachable until it became part of the Siuslaw National Forest in 1908. In 1914, the U.S. Forest Service carved a rough road around the Cape and joined the two small neighboring towns of Yachats and Florence by constructing a wooden bridge across the Yachats River. By 1930 the old wooden bridge had been replaced by a span made of steel. The road was greatly improved and is now part of historic Highway 101 stretching 1,500 miles from Port Angeles, Washington to Los Angeles, California. The panoramic Central Coast of Oregon is now accessible to all. The Civilian Conservation Corps was created in 1933 to provide jobs to thousands of America’s youth during the Great Depression. The result of the CCC effort in Oregon made Cape Pepetua a unique travel destination with miles of inviting trails. Imagine being young and strong and working in this pristine domain of breathtaking beauty where you can see for miles along the jagged coastal shoreline. Visualize waking to a crackling fire amid a silent coastal fog, and gathering with your fellow workers for that first warming sip of morning coffee. The work was hard, but satisfying, and the participants of the CCC experienced life in convivial communal encampments — the remains of which are still visible at Cape Perpetua. These were the lucky ones in hard times, and although most of them are now departed, their lasting legacy of trails and shelters are still in use today. There are three major natural attractions within a short walk from the parking lot of the Cape Pepetua Visitors Center. Thor’s Well, Spouting Horn, and Devil’s Churn – the most exciting being Thor’s Well. In simple terms, Thor’s Well is a collapsed underwater volcanic cave that formed a large round hole on the surface – think very big blow hole. The hole is about 20 feet deep, and during incoming tides and rough seas, the water rushes into the submerged cavern and erupts into a mighty blast of foaming ocean that can easily tumble curious onlookers that venture too close. Seconds after the upward explosion, the Well dramatically inhales the ocean that it just hurled-up. Be careful, you don’t want to be on the ride back to the sea! It’s an intermediate-level hike across the rocky shoreline and up through dense spruce forests to the outlooks. Fortunately, the trails adjacent to the Visitor’s Center are paved for easy access by all. There are 11 trails to choose from; a total of 27 miles of hiking adventures and spectacular views. Approximately five miles south of the Cape Pepetua Visitors Center is another unusual natural attraction – The Seal Lion Caves. This is North America’s largest sea cave, and well worth a visit. You can learn more about what to expect at the caves by viewing our photos and reading our article on the subject here. While in the area, plan to visit the historic Heceta Lighthouse. We spent two nights in the lighthouse keeper’s residence — a unique experience indeed. You can read that story here. For campers there’s the nearby Washburne State Park Campground where you can pitch a tent, and park a trailer or RV. For under $50, there are also several yurts for rent. If you prefer something more comfortable than living in the great outdoors, we highly recommend the Three Rivers Casino and Resort in nearby Florence, Oregon. This is our favorite casino, and is less than 15 miles from Cape Pepetua. The rooms at the Three Rivers Casino are reasonably priced, clean and spacious, and just steps away from an exciting gaming facility. We are non-smokers, so the separate smoking and non-smoking gaming halls are most welcome. If you love great food, you cannot beat the World Market Buffet at the Three Rivers. The buffet offers a wide selection of savory entrees, with several made-to-order specialties. We have reviewed many buffets, and we rate this one – tops. For more information or reservations, click on the Three Rivers Casino website. For an awe-inspiring look at the Oregon Coast, check out this excellent video from Uncage the Soul Productions. We love the Oregon Coast in winter. We think you will too! 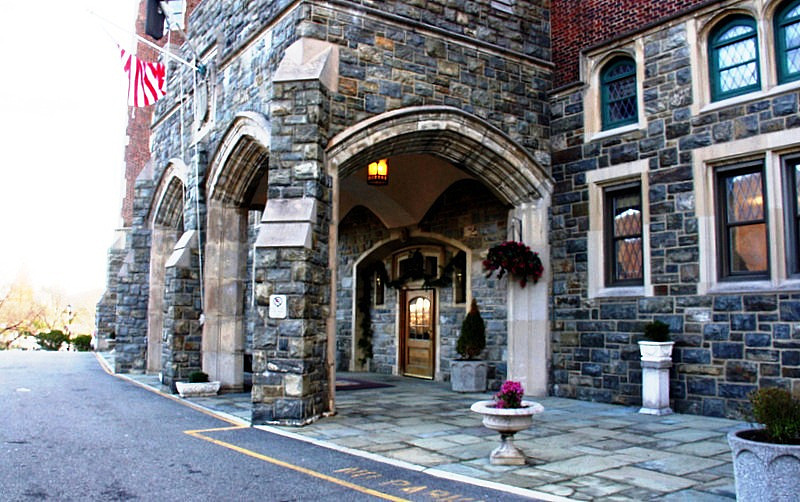 Few public inns in the United States can boast the patriotic pedigree of the Thayer Hotel at West Point. We drove to visit the award-winning Thayer Hotel during the holiday season, and felt it especially appropriate to write about this unique hotel on Veterans Day, when we honor the members of the military that have gallantly served our country. 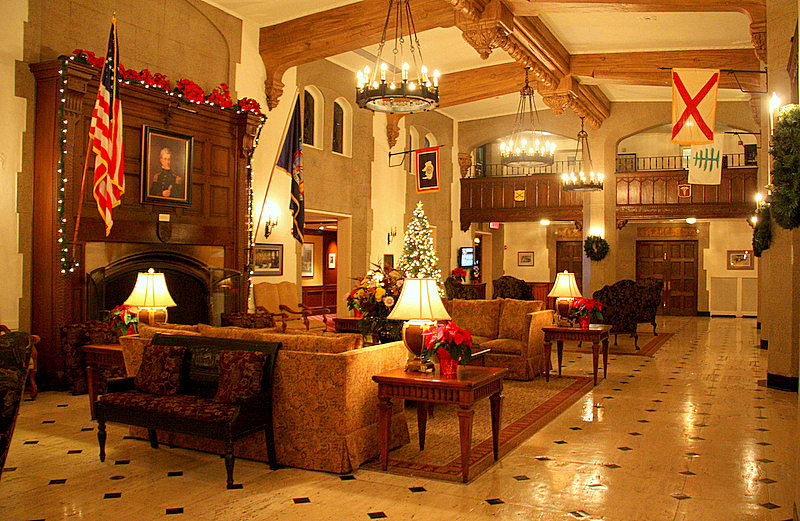 General Douglas MacArthur stayed at the Thayer whenever he visited the military academy. Dwight D. Eisenhower did the same – both as a general and as president of the United States. Four other presidents including John F. Kennedy enjoyed visiting the hotel – you will too. 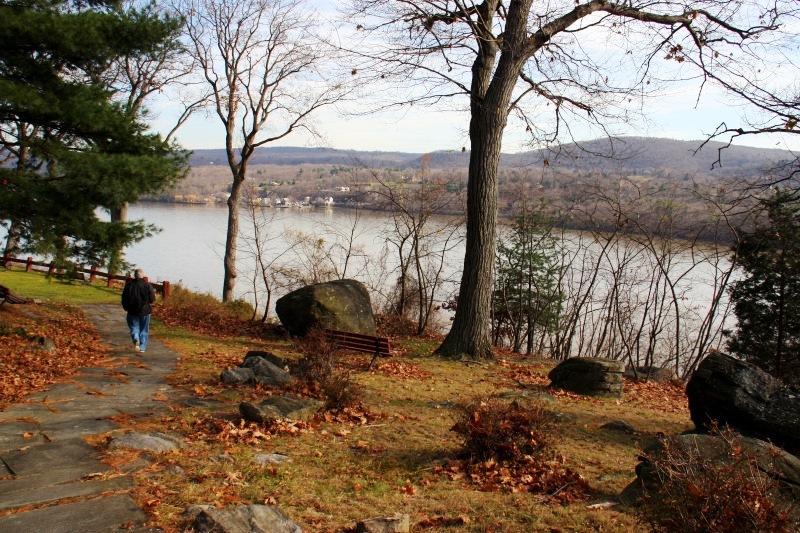 It is little more than a one-hour drive along the Hudson River Valley to reach West Point from New York City. At the entrance to the military academy, you are required to stop at a small stone guardhouse. There you advise the sentry of your intentions to visit the hotel, and he or she will direct you to your destination atop a steep driveway to the right. As you slowly drive up the hill, you are drawn to the many leaded glass windows of the fortification like building. You immediately sense that this is a special place, and it is. 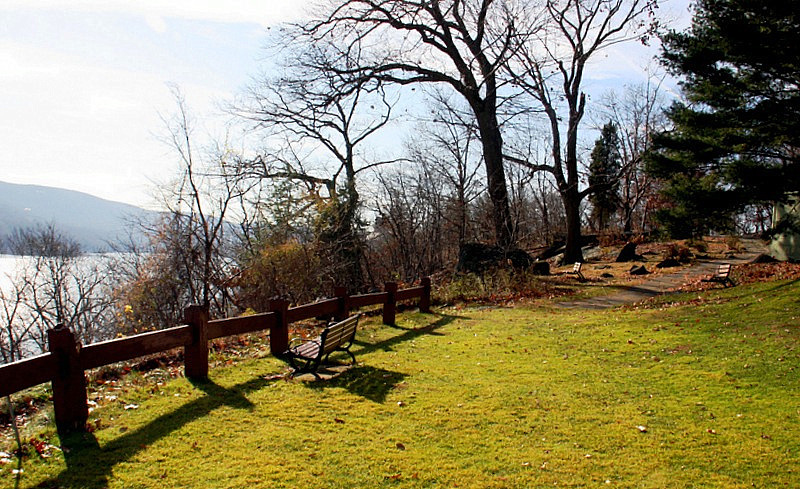 Completed in 1926, the hotel is situated on a prominent bluff that offers breathtaking views of the Hudson River far below. As you walk the manicured lawn towards the adjacent woods on the riverside of the hotel, you will see many stone outcroppings – an assurance that the hotel, like the academy, is built on very firm ground. 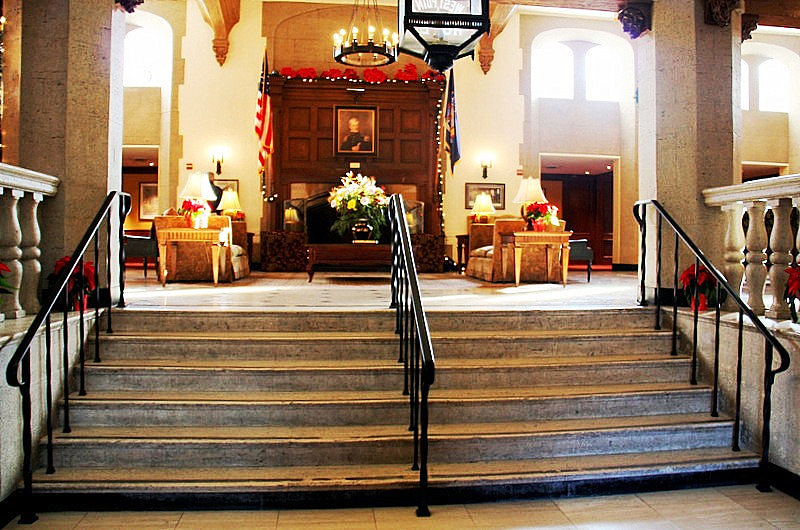 There is a short marble staircase leading from the old wooden front door to the grand reception lobby. Flags decorate the overhead between the first and second floor of the hotel. There is a large fireplace directly across the room from the top of the entry stairs. The whole picture is that of the interior of a castle or military fortification – yet at the same time, there is an extraordinary warmth about the lobby that is quite inviting. We were at the Thayer to attend a ceremony where a guestroom is named after a distinguished graduate of West Point. Honorees are selected from academy graduates that have made significant contributions to the United States and the world. The dedication program is part of a recent multi-million dollar renovation at the hotel. The program is a work in slow and deliberate progress of the hotel’s 151 guestrooms. 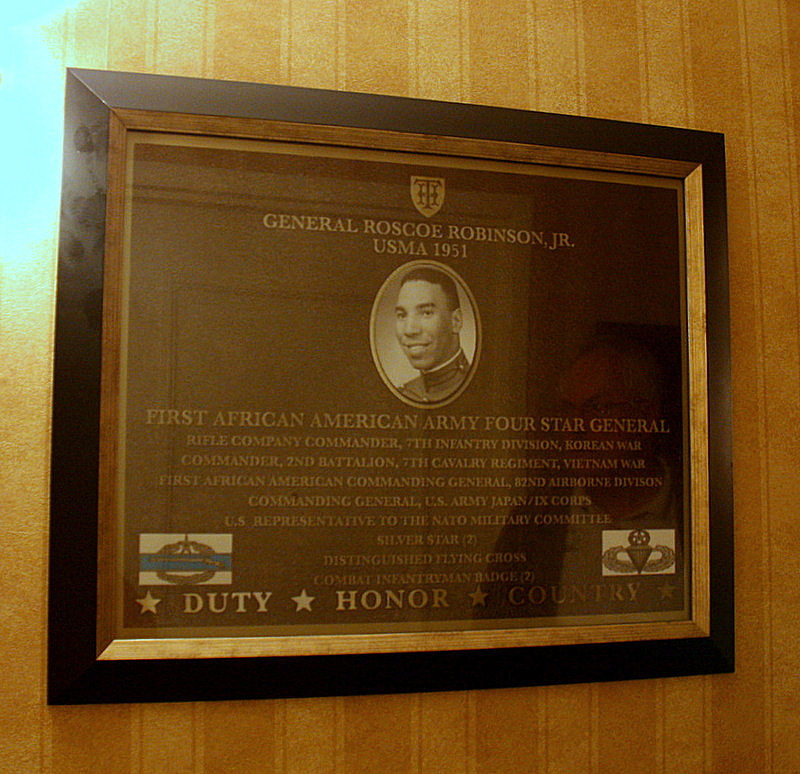 The officer being honored with a dedicated room at the Thayer at the time of our visit was General Roscoe Robinson, Jr., a 1951 academy graduate, and the first four-star African-American general in the history of the U.S. Army. General Robinson served in both Korea and Vietnam. He was the recipient of many service awards in his 34 years of service to his country. In April 2000, the USMA named a new auditorium in his honor. 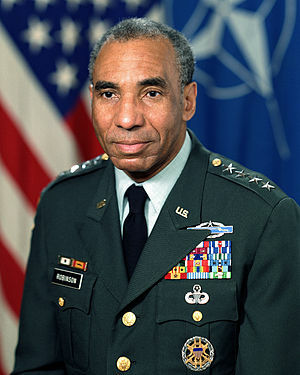 General Robinson died at the age of 64 in 1993. We had an opportunity to chat with a few of the cadets that attended the dedication. The experience was refreshing and left us with an appreciation for the caliber of our future military leaders being schooled at West Point. They are bright, dedicated, and most impressively, patriotic. The room we occupied during our stay was dedicated to Dr. Thoralf M. Sundt, Jr. of the class of 1952. The walls of this guestroom are filled with great period pictures of Dr. Sundt as the cadet that later became a pre-eminent brain surgeon at the Mayo Clinic. Other photos include Dr. Sundt’s family and one of him with President Ronald Reagan who was a patient in 1989. Dr. Sundt was the subject of a segment on “60 Minutes” before his death in 1992. He was just 62 years old. While we were there, we also had an opportunity to talk with several alumni of the 101st Airborne who were attending a reunion at the hotel. It was an honor to meet these retired soldiers and defenders of our American way of life. Humble to a man, they came to celebrate life, but also to remember fallen comrades. 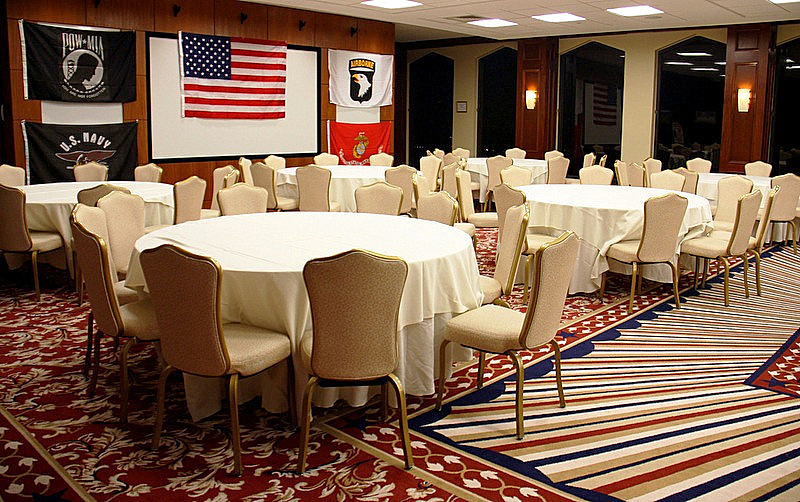 The Thayer has eight meeting rooms and six boardrooms and has become a favorite location for corporate conferences. What better place to instill team spirit and inspiration! Walking the Thayer’s historic hallways is a lesson in patriotism and heroism. There are pictures and mementos everywhere to remind visitors of the motto of West Point – Duty, Honor, Country. 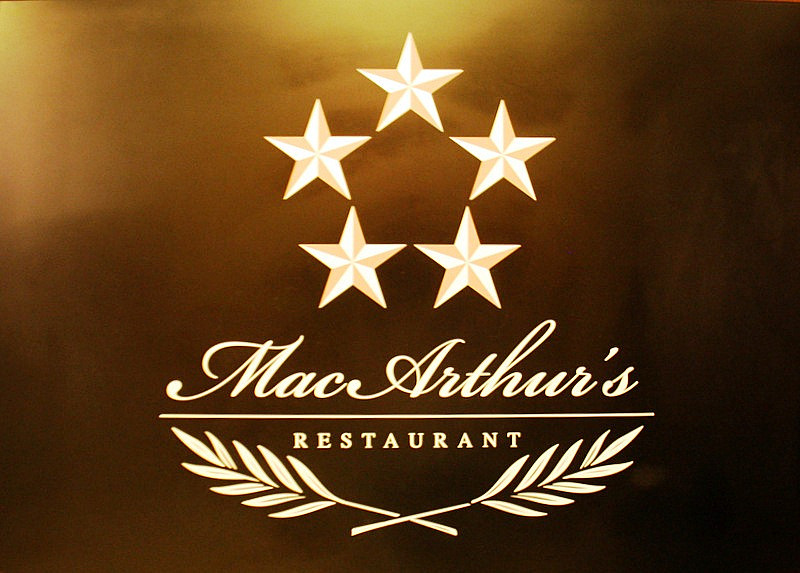 The hotel’s MacArthur’s Restaurant is a stately dining room with leaded glass windows that in daytime cast an oneiric light on the walls and the historic photos of soldiers past, and in evening, add to the rich ambiance of the dining experience. Glowing light from the vintage chandeliers enhances the pleasing sensation of a comfortable setting that is equally fit for a romantic rendezvous or an elegant social gathering. 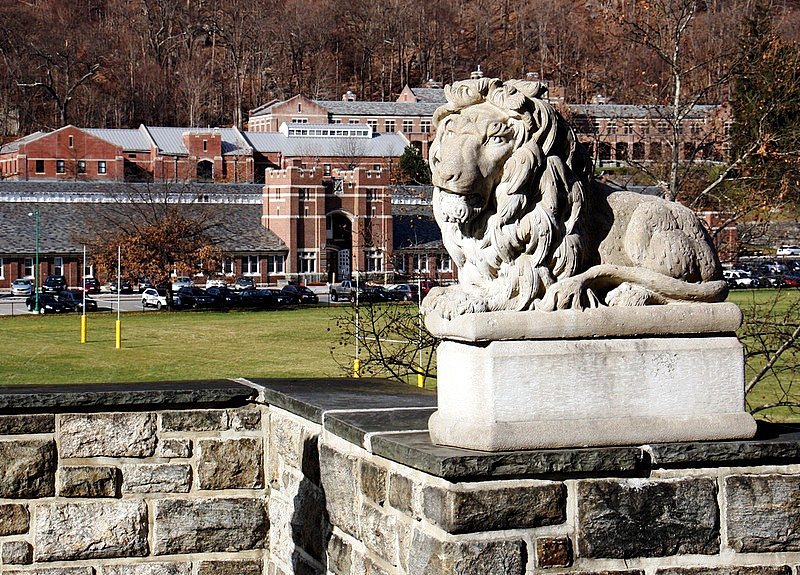 The military academy at West Point dates back to 1802. 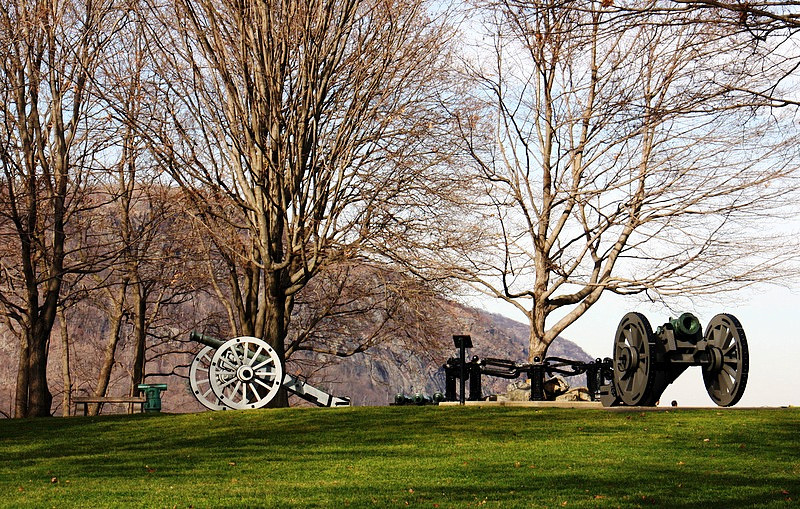 Since its inception, West Point has been in the center of U.S. history. George Washington paraded his troops on these very grounds. 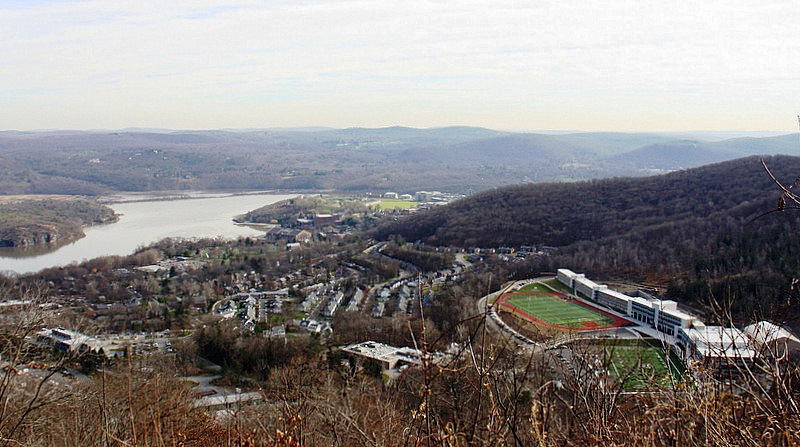 The USMA encompasses 25 square miles – a piece of real estate just a bit smaller than the island of Manhattan. West Point graduates commanded troops on both sides of 55 of the 60 battles of the U.S. Civil War. Of the remaining five battles of the war, a West Point graduate commanded the troops on one of the sides. Edgar Allen Poe attended one semester at West Point, and General George Armstrong Custer is buried there. Two U.S. Presidents graduated from West Point, as did 18 NASA astronauts, 74 Medal of Honor recipients, and 3 Heisman Trophy winners – and scores of great statesmen, diplomats, business leaders, doctors, and engineers. 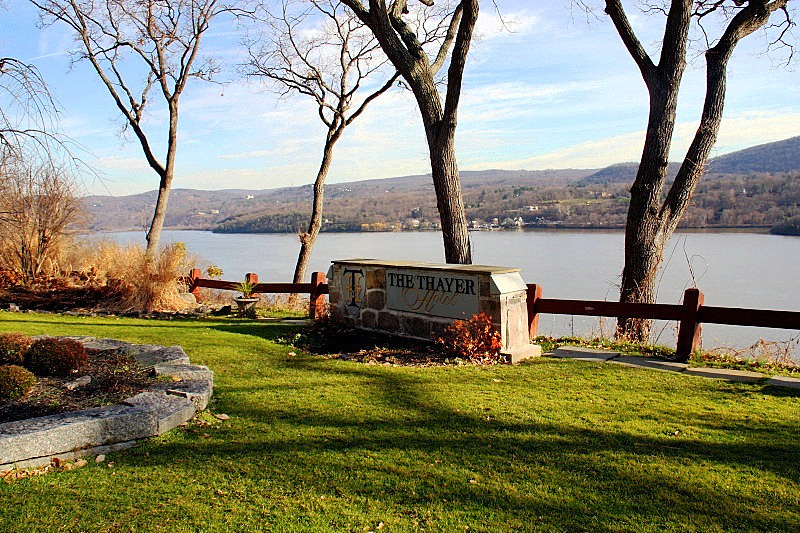 Our visit to the Thayer Hotel and West Point was in December, and even in the cold of winter, the terrain is magnificent to behold. We plan to return to West Point so we can savor the woodland setting in the green of summer – and the fall when the cool air creates a kaleidoscope of changing colors. This is a truly beautiful part of the eastern United States. When you walk the land at West Point, you walk in the footsteps of many who gave all for their country. If you are an American, you are on hallowed ground. The Thayer Hotel is a Historic Landmark Hotel. 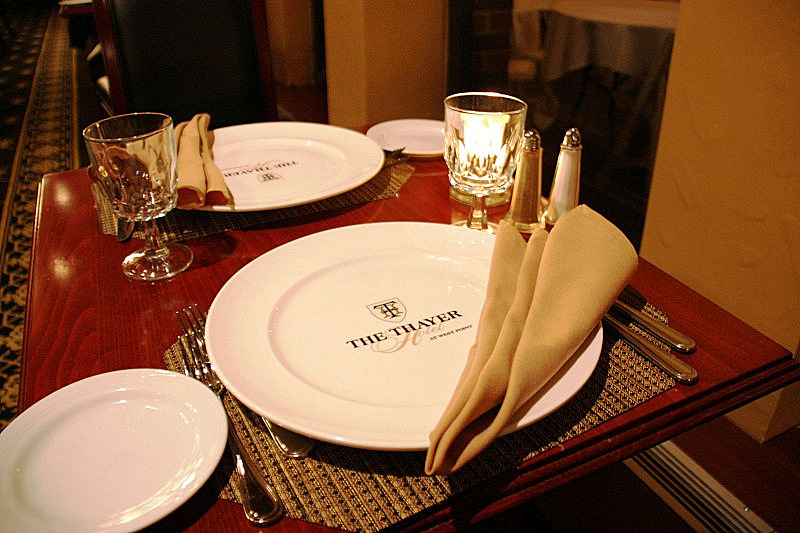 Staying at the Thayer is like living inside history. The famous San Francisco sea lions that occupy prime dock space on Pier 39 first appeared there shortly after the 1989 Loma Prieta earthquake. Then in 2009 they mysteriously disappeared for three months. Where did they go? Oregonians believe that the celebrity sea lions headed north to holiday on the turbulent and exciting shores of the central coast of Oregon. To be exact, they headed for the famous Sea Lion Caves in Florence. As evidence, the Oregon locals point to the massive increase in the annual sea lion population soon after the SF lions turned off the lights in their famous City by the Bay. Sea lion fans rejoice. Currently, nature is providing ample amounts of the odoriferous mammalia to go around. Along with the flabby fellows comes the infamous sea lion aroma. The gamey bouquet is pervasive on the famous California pier, and is inescapable in the celebrated Oregon cave. Take heart, most people recover rapidly from the first initial shock. From about December to August the jolly lions inhabit the largest sea cave in America, which is located just 11 miles north of Florence, and some 200 feet below the roadbed of busy US Highway 101. The cave is 25 million years old, tall as a 12-story building, and about a football field in length. It’s big. The building entrance to the cave sits on a curve in the road that during the summer months percolates with tots and teens under the watchful gaze of parents – all anxious to view the famous pinnipeds in their natural habitat. Once you have paid your admission fee inside the gift shop, it’s a relatively-short and scenic walk down to the elevator pavilion. The elevator was installed in 1961, and today it’s fun to watch people cheerfully bunch into the hoist that transports them 208 feet down to the giant sea grotto below. The cave’s resident Steller and Northern Sea Lions are viewed in their natural habitat from behind a metal mesh screen, which can be a challenge for picture taking, but it is doable. The lions come and go from the Sea Cave on a loose schedule determined by Nature. The choice rock space begins to fill up around December 1st of every year, and the last of the several hundred cave inhabitants usually have somewhere else to go by mid-August. Even when there are just a few – if any – sea lions in the cavern, the Cave is a worthwhile experience. Over the years, the owners of the Sea Cave have embellished the attraction with ample parking and a great topside gift shop (try the delicious homemade fudge – yummy). Look for the natural rock room where the public can view an engrossing film about the sea, cave, and the flora and fauna of the area. It’s interesting to note that there are several species of endangered birds nesting in the cave. Additionally, there are educational displays, and creative colors and lights that are conducive to the grotto setting. From the subterranean sea lion viewing level, walk up the staircase to the observation platform. There you will find a dynamic panorama of the sea – an excellent place from which to view the historic Heceta Lighthouse* perched on a cliff just a few miles north of the cave. The Sea Lion Caves is a fun family activity. We suggest you give it a go. On this visit we chose to stay in Florence at the Driftwood Shores Resort, the only oceanfront hotel in the area. Every room and suite at the Driftwood Shores has a spectacular view. All the rooms overlook miles of pristine beach, and the fresh air, and roar of the crashing waves is a welcome sleep inducer. and a front row seat to breathtaking sunsets from our private balcony. Other unique amenities include an indoor aquatic center, and an electric car charging station. The resort offers ocean cuddling accommodations from single rooms, to one bedroom suites, and three bedroom condos. It is a comfortable base from which to explore the many attractions and activities offered in this scenic part of the Oregon coast. The Driftwood Shores Resort would be a great venue for a wedding, large family, or small corporate gathering. There’s ample gathering space for about 100 people. It’s a beachy-keen accommodation that we think you will like. The Surfside Restaurant and Lounge is located right on property. The food is first rate. Open seven days a week, the restaurant is a celebration of the region’s produce in a striking setting with panoramic views. To check on current specials or make reservations at the Driftwood Shores Resort click here. *To read our story about the historic Heceta Lighthouse look here. Photos Copyright © 2016 Judy Bayliff – some Driftwood Shores facility photos courtesy of Driftwood Shores Resort.